We often think of light as a facet of nature, but over the past few years, scientists in the Swiss labs of La Prairie have been toiling away to uncover the equation that gives skin its luminosity—and finally this theorem has been realised. It’s a formula that is strongly affected by the skin’s colour spectrum, and the naturally occurring pigments that exist in the different layers of the epidermis. There are grey pigments, created by dust and pollution in the air around us. Brown, caused by UV and infrared rays as well as the blue-light damage from the computer and phone screens that we depend upon on a daily basis. Yellow is an effect of oxidative stress, thanks (or no thanks) to free radicals that break down essential skin proteins such as collagen. And finally, red, a side effect of inflammation due to a variety of stress factors that dilate the blood vessels that run below your skin’s surface. These pigments absorb the light that hits your skin, turning beautiful white light into coloured light, reducing the intensity of light reflection and thus in turn the skin’s perceived luminosity. And when ageing factors come into play—elements such as the loss of collagen, uneven skin texture and fine lines and wrinkles—the skin’s ability to reflect light is even further compromised. The solution sounds simple enough in concept. And La Prairie’s Equation of Light is indeed deceivingly simple: subtract the pigments, and your skin will see added luminosity, immediately. Of course, these things are easier said than done. 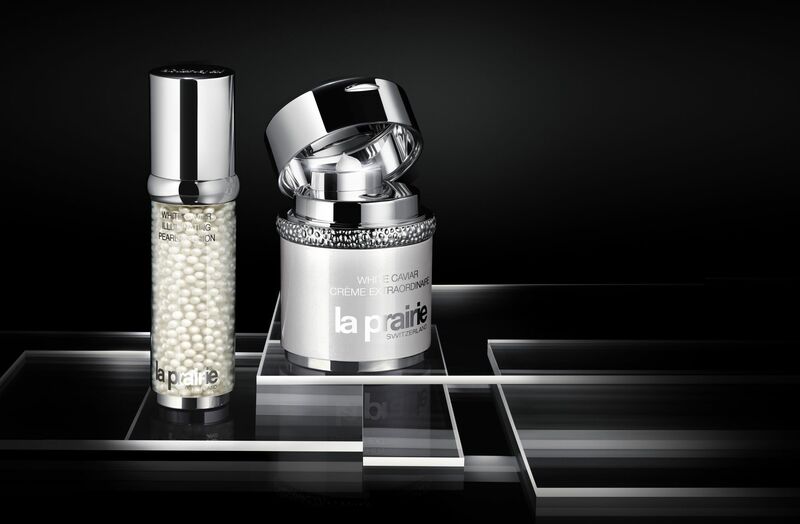 After years of research, La Prairie’s scientists have come upon a two-step response plan: the White Caviar Illuminating Pearl Infusion and White Caviar Crème Extraordinaire. Together, they are a one-two punch that diminishes the grey, brown and red discolouration, as well as the yellow cast, and smooths the skin’s surface so that light literally bounces off the skin. The White Caviar Illuminating Pearl Infusion is powered by an exclusive Illuminating Compound, while the White Caviar Crème Extraordinaire utilises a breakthrough molecule known as Lumidose, which travels deep into the skin’s layers to eliminate chromatic disturbances that dull the complexion. Both of the products also feature Golden Caviar Extract, a skin-firming substance that also improves the levels of light reflection, using an Exclusive Cellular Complex to jumpstart your cell activity and making them act like young cells once more. While these two products are without a doubt the power couple in your daily skincare regime, engaging in the full ritual will offer the skin unparalleled benefits: twice a day after cleansing, use the White Caviar Illuminating Clarifying Lotion and Eye Serum before giving your skin a high dose of active ingredients with the White Caviar Illuminating Pearl Infusion. Finish with the White Caviar Illuminating Eye Cream and the Crème Extraordinaire—and get ready to shine.